January 13, 2016 by Ecommerce News. About Statistics with tags Spain. 5012 views. 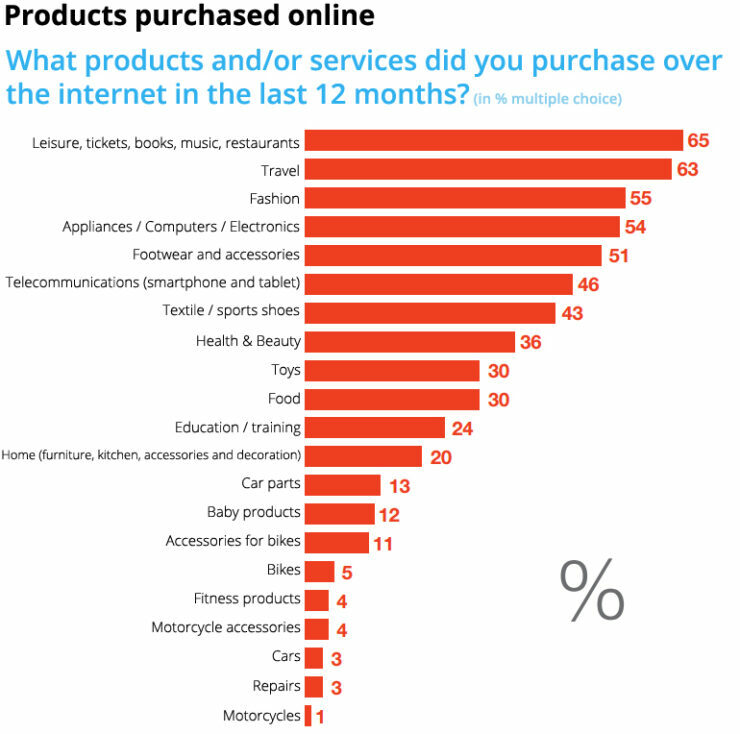 When Spaniards shop online, they mostly buy leisure-related products. Show tickets, books, music and restaurants are the products that are purchased online the most. Two out of three Spanish consumers shopped these kinds of products on the internet. Also, travel and consumer electronics were very popular last year. 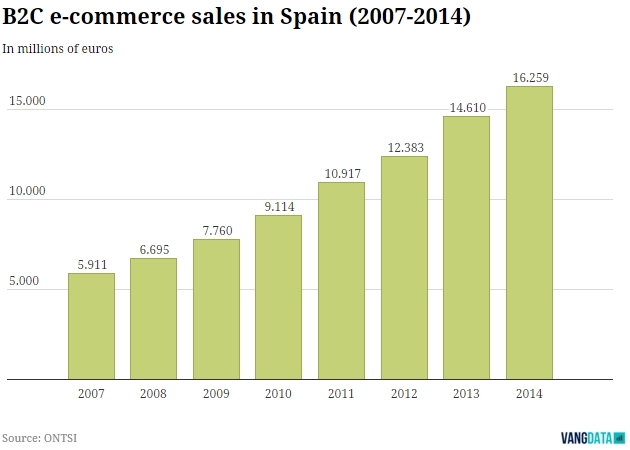 Ecommerce continues to gain ground in Spain. Local internet users have made 30 percent of their purchases online in 2015, compared to 25 percent the year before. The average total amount spent on online shopping increased by 2 percent, from 1,330 euros in 2014 to 1,354 euros last year. 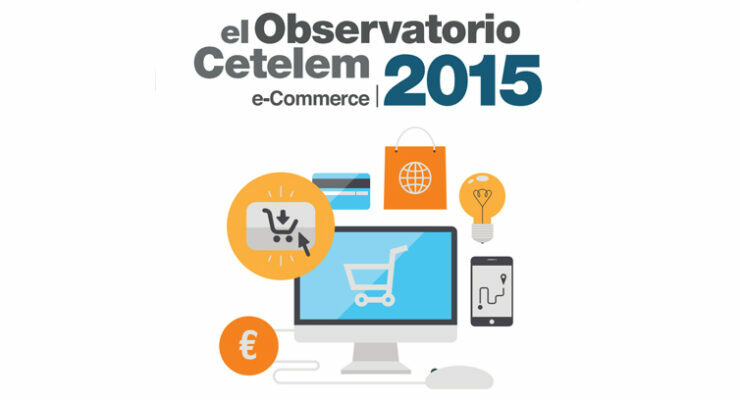 These are some of the results from ‘El Observatorio Cetelem Ecommerce 2015‘, a study done by consumer credit specialist Cetelem, which is a reference in Spain when it comes to market information and analysis. Another study, yearly conducted by the National Observatory for Telecommunication and Information Society, the B2C ecommerce volume amounted to 16.3 billion euros in 2014, thereby representing an increase of 11.3 percent compared to the year before. It’s still unclear what the final figures are for the year 2015, but when looking at the recent growth of ecommerce sales in Spain, it will probably hit the 18 billion euros mark. Back to the study of Cetelem, its data shows that 35 percent of correspondents have made an online purchase using a mobile device last year. In 2014, this percentage was just 23 percent. And when it comes to gathering information before someone decides to buy something online, most consumers tend to rely on their friends and family. Also brand websites are popular research destinations. Correspondents were also asked what their preferred payment method is when they are online shopping. PayPal was chosen by 72 percent of consumers (2014: 71%). Other popular payment methods in Spain are debit cards, cash-on-delivery and credit cards.